Animals must solve a series of problems in life, such as finding food, escaping predation, and raising offspring. One of the main evolutionary adaptations animals have for solving these problems is to interact and form relationships with other members of their species. The goal of our research is to understand the evolutionary costs and benefits of social relationships, especially how these evolutionary consequences pertain to individual health, disease risk, and survival. How do social organization and behavior influence the spread of infectious organisms, including bacteria and parasites? How does an individual’s social context influence their physiology, immune responses, and life span? These strands span several levels of biological organization, from populations to whole organisms, and their associated microbes and parasites. We use diverse research techniques, ranging from behavioral observations of wild animals to immunology and noninvasive genetic tools. Our results are relevant to species conservation, the evolution of animal social relationships, as well as human and animal wellbeing. To answer our research questions we work in natural populations of social mammals. Much of our research is on the wild baboons that live in the Amboseli ecosystem, in Kenya, whose lives are followed by the Amboseli Baboon Research Project (ABRP). Beth Archie helps to lead ABRP, along with Jeanne Altmann, Susan Alberts, and Jenny Tung. Founded in 1971, the Amboseli baboons are among the best-known populations of wild primates in the world, with detailed information on individual life histories, social relationships, ecology, and genetics. We also collaborate with the Amboseli Elephant Research Project; led by Cynthia Moss, this group has been working to conserve elephants and understand their behavior since 1972. Research in the Archie lab involves fieldwork as well as genetic and parasitological work in the lab. 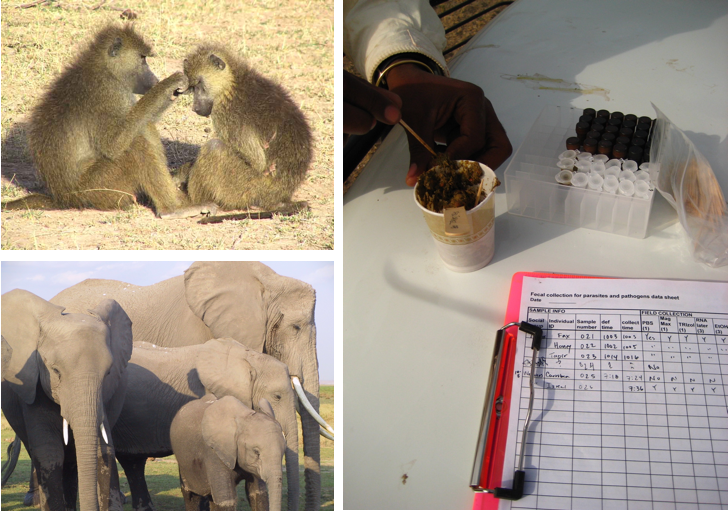 When we’re in the field, we observe the behavior of wild mammals and collect samples for genetic analysis—usually from noninvasive sources such as dung. In the lab, we use microscopy and noninvasive genetic tools to characterize the microbes parasites infecting individual animals. How do social organization and behavior influence the spread of infectious organisms?